Greetings to all our friends! After another long summer hiatus, Schola classes are back in session and Scholegium is back in your inboxes. I've been tremendously busy this summer, conducting the week-long Latin In A Week session in four different cities, a three-day Schola Summer Academy in Lancaster, PA, and the second annual Hill Abbey (a two-week reading course in the early church fathers here on our farm in Idaho), as well as speaking at several seminars and attending Credenda Agenda's annual Trinity Fest. See "Upcoming Events" on Schola's homepage for links to all these. But that's not all. In the middle of August, my two oldest daughters got engaged in the same week! They and their respective afianced are planning a double wedding on December 28 and I hope you all will think congratulatory thoughts for their sake. God bless 'em all and grant them happy marriages. I hope you enjoy this bouquet of musings. If you live in the Moscow, ID, vicinity, please consider attending a seminar on Four Great Cities of the Ancient East (we'll have a better name shortly) conducted jointly by Evan Wilson (The Big Haus) and Wes Callihan of Schola Classical Tutorials on Saturday, November 10, at The Big Haus. More information to come soon. Schola offers tee shirts and mugs and will soon have polos and hoody sweatshirts as well. Be the first in your neighborhood to have one. Be the envy of all your friends. Or just pull them out when no one's looking. We are working on next year's overseas tour and we think we might have some very exciting news in a week or so. Don't touch that dial! At the end of April I described the bright star Vega and mentioned that it was rising just after sunset at that time of year. But now, at the beginning of September, if you'll go out about a half hour after sunset -- that is, at the end of civil twilight and the beginning of nautical twilight --when the first bright stars are beginning to show, you'll see Vega right overhead. Remember, Vega is the bright star in the constellation Lyra (the Lyre, or Harp) and the fifth brightest star in the heavens. Actually, the first celestial object you'll be able to see will be Jupiter, in the south; but after you've ogled Jupiter a bit, turn your attention right overhead and you'll see Vega. Off to the east of Vega is Deneb, the bright star in Cygnus the Swan (or the Northern Cross, with the head of the cross being the tail of Cygnus). Deneb will show up a bit later as it's not quite so bright as Vega. And finally, quite a bit further south you'll see Altair, the bright star in Aquila the Eagle. These three make up the Summer Triangle, which you can see in this picture. The picture shows what you'd see if you first faced south then looked straight up to find Vega (and of course if the sky were much darker so that you could see the Milky Way). Aquila will be halfway down the sky toward the southeast. Cygnus the Swan is flying right down the Milky Way, which runs through the Summer Triangle and down into Sagittarius (the Archer), and which you can only see if the sky is quite dark. 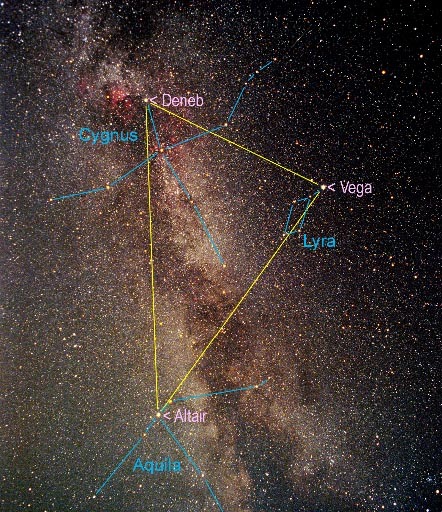 Although the stars and constellations that make it up were known back in Greco-Roman times, the Summer Triangle itself is not an old asterism (star picture); it first shows up on early nineteenth century star charts as just an outline. Then in the early twentieth century the name "Summer Triangle" begins to appear. September gets its name, which comes from the Latin word "seventh", from the fact that it was the seventh month of the old Roman year which did not include July till Julius Caesar's reign or August till Augustus Caesar's. It was the beginning of the year for the Eastern Roman (Byzantine) Empire from the mid-fifth century onward, and still is the beginning of the ecclesiastical year for the Eastern Orthodox church, which has been shaped by Byzantine history. In the temperate and northern regions of Europe and American it's in the middle of the harvest season and was in fact called "harvest-month" by the Anglo-Saxons. The full moon in September is traditionally called the "harvest moon", and poets like Edmund Spenser symbolize it with sickles, scales, and other harvest-time agricultural implements. For many people in the western world, the academic year has already begun by the beginning of September, and of course, the end of summer comes in late September, on the autumnal equinox (on September 23 in 2007).